During an evening walk, a strange emptiness compelled me to look towards my right, behind the wall covered with a green hedge—nothing. A battered almirah jutted out from a demolished house, once home to one of the architects who built Chandigarh. 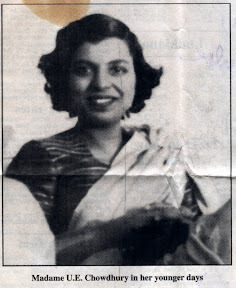 Urmila Eulie Chowdhury was an extraordinary phenomenon—a pioneering architect, teacher and designer who contributed so much to the making of Chandigarh, right from planning the bricks and mortars to laying the foundation of cultural activities along with her friends Champa Mangat Rai and N.C. Thakur. She also established Alliance Françoise de Chandigarh in 1983. The dapper author, N. Iqbal Singh, was a neighbour and a frequent companion. “Why I hate Children,” came by mail soon after I joined The Tribune. It was a witty, perceptive article and before long Eulie was a regular contributor to the Saturday Plus supplement. She wrote a well-informed piece about Male Cooks of Chandigarh, and once admiringly about a woman who could “drink any man under the table”. The lady did protest too much, but when Eulie retorted that she had much more to say, and the tirade became a simper. What a woman Eulie was! Petite, fiery and totally cosmopolitan. She was born in Shahjehanpur in UP in 1923 where her uncle worked in the railways; got her Cambridge School Certificate from Kobe, Japan; studied architecture and music in Sydney, and got a diploma in Ceramics from Englewood, New Jersey, USA. That her father was in the diplomatic service explains the globe trotting. I had just returned from New York, and was familiar with Englewood. In time we became friends, and I would walk down to her house to meet her. Eulie had come to India in 1951 to work with Le Corbusier. Her husband, Jugal Kishore Chowdhary, was a consulting architect with the Punjab Government. Eulie would narrate many anecdotes about the time when the city was taking shape and of Le Corbusier, Pierre Jeanerette, Jane Drew and Piloo Modi with his dogs. Eulie was awarded a gold medal by the President for design of low-cost furniture in 1954. A 1996 article by Sumit Kaur, who is now Chief Architect, Chandigarh, says: “All the furniture in the buildings of the Capitol complex and the Panjab University’s Gandhi Bhavan, library building and the Guest House had been designed by her,” says the article. The International Archive of Women in Architecture says she was the first woman to qualify as an architect in Asia. Eulie was Chief Architect Chandigarh (1971-76); Punjab (1976-81); and Harayana (1970-71). 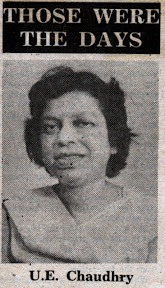 She was Principal of the Delhi School of Architecture and Planning (1963 to 1965). The main block of the Polytechnic for Women and the Hostel Block for the Home Science College were designed by her. She contributed Sinners and Winners, a column in The Tribune that pointed out mistakes that had crept in the paper. She also wrote for a variety of architectural journals. Till the very end, she was active, and cause-driven. She joined hands with Mac Sarin in advocating euthanasia. Eulie, who died on September 20, 1995 , entertained with poise and grace. She would greet her guests as they walked over the black concrete floor that always had a mirror-like finish. What a home it was—witness to history in the making, soaring intellectual discussions, petty party squabbles and delicious gossip. It was also a living example of Corbusier’s design. Seeing this lovely home reduced to rubble left me with a heavy heart—I found it difficult to come to terms with what the home of one of those who built Chandigarh had been reduced to.